We are pleased to announce that Smith Brothers Agency has acquired 4Twelve Pictures in a strategic move to deepen the agency’s content creation and in-house video capabilities. The acquisition will seamlessly integrate 4Twelve’s talented video production team into Smith Brother’s existing award-winning Content Studio, which provides clients with full-service solutions for content creation and digital marketing. Based in the Lawrenceville neighborhood of Pittsburgh, 4Twelve Pictures acted as a multimedia production company, creating everything from full-length films and music videos to Vine videos and web shorts. The company’s former clients include Time Magazine, Carnegie Mellon University, Northeastern University and Pittsburgh Youth Leadership. This move strengthens Smith Brothers’ ability to deliver the creative idea further into social media and other digital channels. In an ever-increasing opt-in world, where brands are competing for consumers’ attention – video is fast becoming a preferred medium – whether it is a long-format narrative or a short 15-second Instagram post. As an agency already known for real-time video marketing, SBA is pushing the bounds into 360-degree and other formats. “In the past, agencies would partner with a production company to produce video content,” said Michael Bollinger, president at Smith Brothers. “By bringing video capabilities in-house, we give the directors and videographers the ability to provide strategic input during planning and brainstorming. It ensures the entire team is invested in the creative output from the very beginning.” It also makes the agency more nimble by giving us the ability to react quickly and produce video content relevant to trending topics. Moving over to Smith Brothers from the 4Twelve team are Joshua Eisenfeld, Zachary Eisenfeld, Daniel Finegold, and Stephen Hicken. 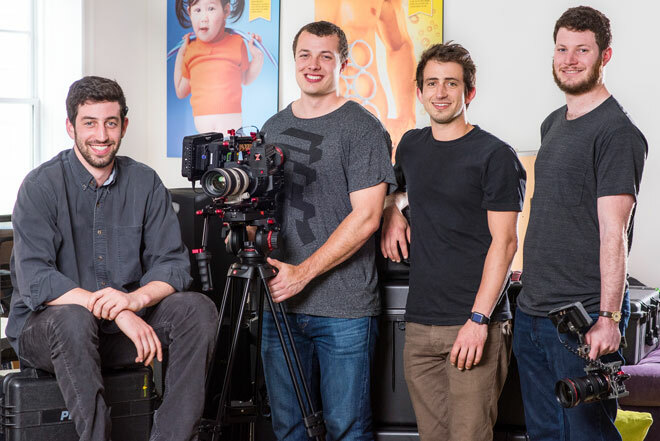 They each play unique roles in directing, cinematography, editing, and production – but one thing is universal – they love working in film and creating meaningful brand stories via video. As an interesting side-note, the Smith Brothers are picking up another set of brothers, Joshua and Zachary Eisenfeld. “Bringing Josh and Zach on board at SBA, a company I founded with my brother, was a natural fit and a bit of a happy coincidence,” said Lindsey Smith, co-chief creative director and co-founder of Smith Brothers.